Yesterday was one of those special days! 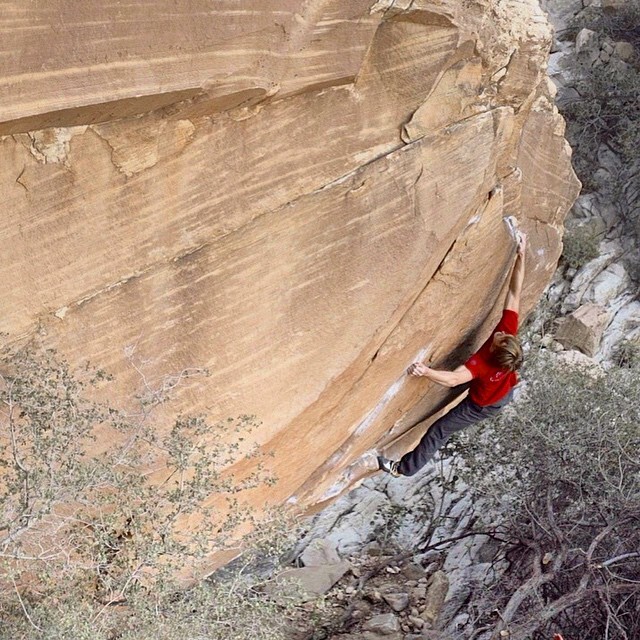 First ascent of Kintsugi (V15)! 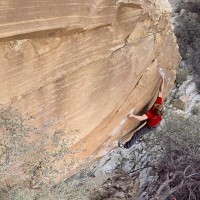 This project discovered by @menagerieclimb is maybe the most impressive line I’ve seen in Red Rocks! Early on in the trip we went to check out this project and immediately it took the number one spot on my list. But first on the agenda was sending The Nest (V15), which went down after days of effort and rest. After that it was finally time to get on this incredible project! Then the unexpected happened and I ended up with 15 staples in my leg. I couldn’t even walk and I thought I was out for a long time. However, my leg healed incredibly fast to a point where I could carefully hike up the hill and go work the moves on a rope. Soon enough I was trying it ground up with the staples still in. Yesterday I actually topped it out! Kintsugi is one of those climbs that you only get a handful of in your lifetime. It’s tall and proud, great rock and the way it climbs is just perfect! Every try is ground up. Once you stick the jump start, it’s on – all the way to the top! He actually did the nest BEFORE getting staples in his leg. Yeah, but still! Thanks for the correction! Leave a Reply to Kray Sean Click here to cancel reply.